World Citizen ID dog tags are worn as a pendant around the neck, mostly by young people who feel like they are citizens of the world. This is not the first Coexist T-Shirt created, but it may be the nicest, using six religious symbols and the ecology symbol to spell out COEXIST. The Coexist image has become instantly recognized as a plea for religious tolerance, cooperation and respect. By adding the ecology symbol, it extends the idea of respect and interdependence to include the earth itself. Available in Black in adult and youth sizes. Few anti-prejudice T-shirts make as clear a statement or offer a design whose meaning is as instantly understood. The message is so simple and clear that even young children have "explained" to me that the prejudice "doesn't fit inside the heart." And yet, the big red heart is inviting and non-confrontational. It is a perfect balance of sweet and loving, and in-your-face. 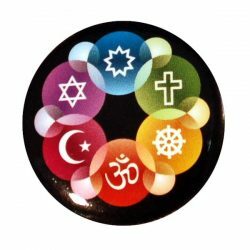 Peace Be With You Interfaith name tags will be useful for any event that is open to the public - including weekly devotions, study circles, pot lucks, Holy Days, parties, celebrations, and any events co-sponsored with another group or religion. The interfaith symbols across the bottom tell your guests that everyone is truly welcome. The phrase "Peace Be With You" across the top is a universal greeting that is both reverent and celebratory at the same time. World Citizen Lanyard Set contains both the neck lanyard and a shorter keychain clip lanyard. The world is shrinking and becoming more and more interconnected every day, making us all World Citizens. We can fight it, as some are, or embrace and celebrate our global heritage. If you believe that the earth is one country and all humans are its citizens, then wear this shirt with pride.